The black with copper trim DVO-3R Large Carrying Case for Camcorder with Matte Box and Follow Focus from Porta Brace is designed to hold compact Mini DV camcorders and accessories. 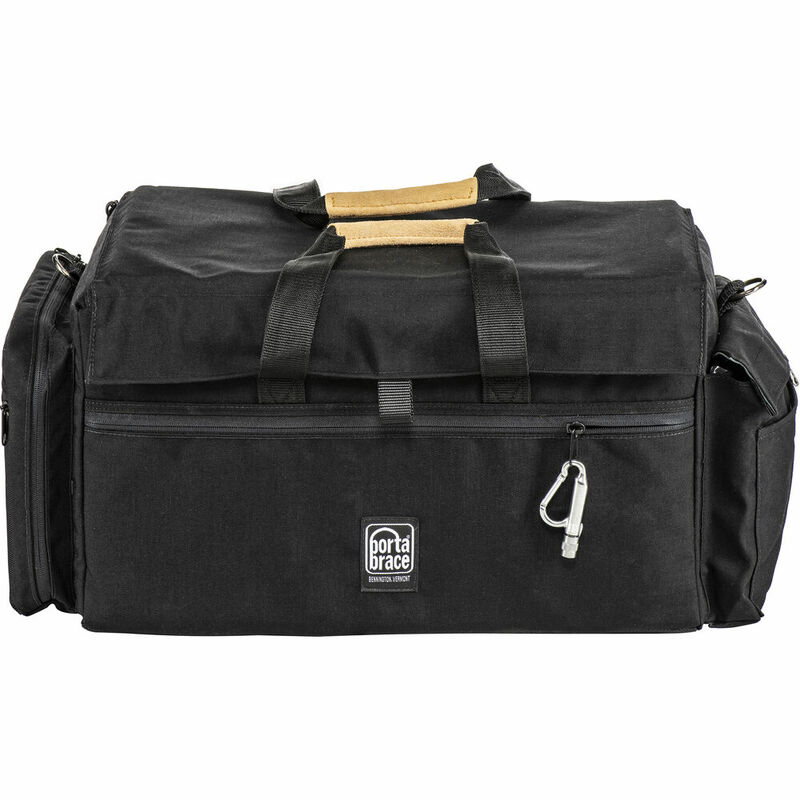 It is made from 1000 denier Cordura fabric with a slip-resistant, easy-clean rubber bottom and rigid dividers. It fits popular mini-DV cameras with add-on items including a matte box attached and wireless mics. A camera tie-down strap and a soft stuff pouch keep the camera stable. A plush, 1.0" thick foam pad adds extra stability and protection. The DV Organizer case is stackable and has a rigid wall frame for use as a production case. Included with this case are two CS-B9 zippered stuff sacks, 8 x 12 accessory pouch, heavy-duty suede shoulder strap, LI-GLW illumination strip light pocket, and white balance card. Box Dimensions (LxWxH) 22.0 x 15.0 x 13.0"
DVO-3R Large Carrying Case for Camcorder with Matte Box and Follow Focus (Black with Copper Trim) is rated 4.9 out of 5 by 7. Rated 5 out of 5 by Mack Truck from Great for the EX3 After I broke my EX3's visor in a Petrol backpack I have been looking for a bag with maximum protection and some extra storage for the laptop, wireless mic, ect. This case is just perfect for traveling, the camera is secured, and it even though it's a little heavy and large to carry around it fits the overhead compartment when you fly. But I would not go back to any other brand, Porta Brace definitely make the best camera cases, and part of the reason is it is made in the USA and not in China ! Rated 5 out of 5 by Mike A. from HUGE BAG! This bag is one of the largest bags I have in my collection, and I LOVE IT! - Use it to hold all my Shape Shoulder Rig gear. Mattebox, handles, top barn door, support arm, shoulder pad, and it has a pouch to store the rails and an accessory bag to hold all of the focus rings and little bits. Would be nice with more dividers but works well and protects the gear. I think we also throw a couple Senn mics in their cases and use the side zip punch for the follow focus. It Doesn't have a velcro handle to attach the 2 handles and secure the bag, but it looks classy and feels nice. Rated 5 out of 5 by Tornado Alli from Bag Full of Options Lots of pockets and pouches allow a bunch of options for how to back your equipment, the bag is very sturdy and has room to hold a lot of stuff without being too big. It' not a small bag, for perfect for an EX3 or similarly sized cameras. Rated 5 out of 5 by The Reverand from Awesome Bag!!! Hi-Quality Build Video cameras, Gear bag,Quick-Draw Shooting. Stores Camera w/Matte Box on and plenty of space for Accseeories & Gadgets Soft Bags included are a big plus. The Handle grips could use a wrap velcro closure, Other than that Porta Brace Standard top of the line quality, W ehave 3 of their bags that are still in use long after the other wannabes have come apart and retired. Rated 4 out of 5 by Film Producer from Perfect fit for Sony PMW-EX3 Proper camcorder bag for the Sony PMW-EX3. The camera fits perfectly and there is ample room for accessories. Quite a bulky bag, as can be expected with a camera like the EX3, but easy to carry and made of very sturdy material. All that Portabrace can do to make this a perfect bag, is by adding more compartments for more accessories. Rated 5 out of 5 by Devin W from Great Bag Ive used this bag for a week, carrying around my FS700 Rig and its very roomy. Great quality as expected from Porta Brace and has many pocket/compartments to carry batteries and accessories. Can't go wrong with this bag.